This first one shows the northern hemisphere, southern hemisphere and global surface temperatures as seen by the IPCC in the AR5 report - looking back 2,000 years. 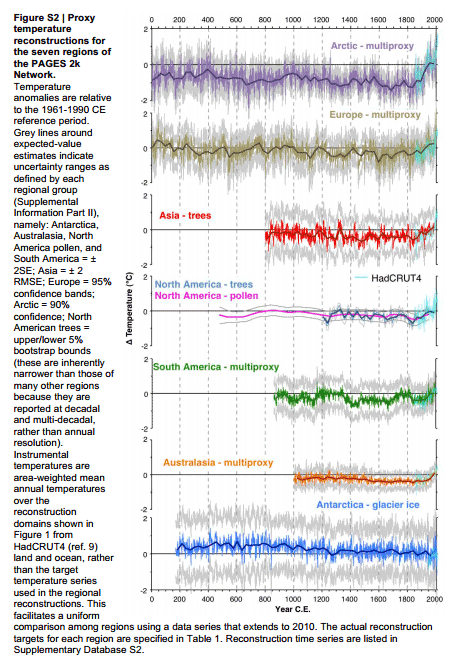 Next, the land surface temperatures from around the world, as seen by PAGES 2k spanning 2,000 years. You can regard this section as the short version of two recent articles, which were both rather long. For an explanation read the articles doozy and doozy doubled. I've lined up the top and bottom panels so the years are roughly aligned. Anthony claims both top and bottom are representative of global surface temperatures, despite the fact they are each local to tiny different regions, and are not global, and they are quite different to each other. They cannot both represent global temperatures. The Pyrenees were coldest when Greenland ice sheet was warmest, warmest when Greenland was coldest, and cooled when Greenland warmed. You can understand why deniers get so confused. They are being told to believe wrong and contradictory stuff day in and day out. Anthony Watts doesn't just get everything wrong, he can't even keep his own wrong consistent. A Doozy Denier Don from Anthony Watts: Medieval Warming was 11,500 years ago! If you want to criticise something, at least get it right. Watts was discussing the Esper et al. 2015 paper, "Long-term summer temperature variations in the Pyrenees". His post was about temperature proxies, not GLOBAL temperatures, and a paper whic said in the abstract, that for the Spanish Pyrenees, "Results indicate that late 20th century warming has not been unique within the context of the past 750 years. "I can't comment on Mann's work cus all I have is some stuff from the Pyrenees"
"More facts against the Mann – ‘late 20th century warming has not been unique within…the past 750 years "
And what happened to our poor, dear, Central England Temperaures that deniers used to be so fond of? She's feeling like a Hollywood actress who has reached a certain age. "MH is almost always wrong when it comes to climate." - examples, please. Chapter & verse. Maybe I rushed to judgement, MH. If so I apologise. However, we could start with your chosen moniker. Then we could move onto you being an apologist for Anthony Watts in this thread. Then I could quote you as saying " I speak as one who's a sceptic, firmly in the "show me" camp, and who instinctively distrusts those in the "believe me" camp. Don't just tell me - prove it." in the face of ample proof. On the other hand you do appear to try to investigate for yourself on occasion. And you don't always stick up for the deniers at WUWT. On one occasion you were very scathing of them. I can't be bothered looking any further. If you want to show that you are inclined to accept science, and agree that scientists generally do their best to get it right, and do so much more often than not, and that you recognise WUWT nonsense for the nonsense that it is, then feel free. "There's no mention of global temperature(s) anywhere in the post,"
Lie much? The very first words are in re a quotation of Michael Mann starting with "overall warmth of the globe". That's Watt's context, and it's how he interprets the text he bolds from the Esper paper: "Results indicate that late 20th century warming has not been unique within the context of the past 750 years." And in the comments, Luke writes" This reconstruction is based on one location so it does not represent a fundamental challenge to Mann’s global reconstruction." "if Mann heavily weights a proxy in one location to make a global claim, does that make it OK for him, but not for anyone else?" So he takes Esper to et. al. to be making a global claim. Lying deniers are not "mostly harmless". Anyone reading it would reasonable deduce that Watts was using Esper's study to make the point that Mann must be wrong because one site on the Spain-France border comes up with a slightly different result. I agree with Sou that Watts doesn't understand science. If he had read the paper, he would not have found the global extrapolation he would have liked to have seen. But he didn't do a "global extrapolation" anywhere. If he did, explain where, and in what words. Stop playing dumb, MH. Catmando already pointed it out. Everyone at WUWT knew what Anthony was arguing and some of them disagreed with him. 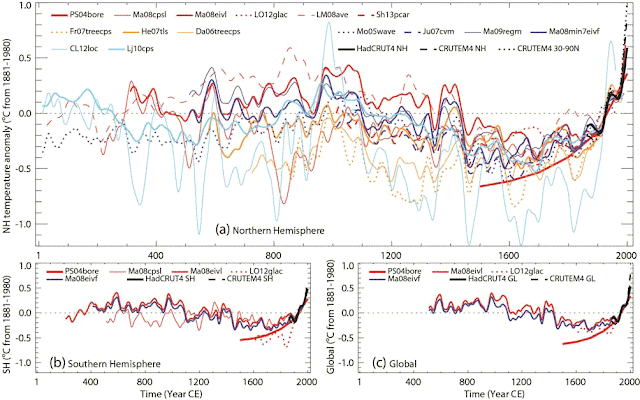 Further down he used Esper's reconstruction of a spot in the Pyrenees to argue that the MWP was global, writing: "The reconstruction, in red, shows Medieval Warming Period is clearly seen to have temperatures greater than the current modern period." Thing is the main chart doesn't even start till 1300, well after the MWP. And the dotted line shows that, in the Pyrenees at the height of the Medieval Climate Anomaly, it was cold not hot. Check the links under "related HotWhopper articles" up above. It's all there. I thought the MBH's were Northern Hemisphere only. Its unfortunate that Anthony's mind is currently rivetted on the Pyrenees- no doubt because that spot is uniquely important to global climate - when yet again there are climate-related issues nearer to home that would otherwise have grabbed his attention. Lake Mead is the largest reservoir in the US when at maximum capacity, but now it is at just 38 per cent of that max. Federal forecasters project that the water level could drop as low as 1,073 feet above sea level later this year. Should that level persist into the start of 2016, it would prompt a shortage declaration which would require states that pull water from the lake to cut back on usage. Those states include Colorado, Nevada, Arizona and California. The issue is why Anthony wants to focus on the Pyrenees while ignoring what is happening all around him. I'm sorry, I realise that a winged monkey gets very upset, and starts bouncing up and down on its knuckles when the wicked witch gets ridiculed, but you really ought to get used to it. And you may, one day, realise that you don't get to dictate what we discuss. Oh, and I lied about being sorry: because the more ridiculous you make yourself too, the funnier it gets.